Do you love the ocean and the outdoors? Do you have an interest in studying wild and diverse ecosystems? Do you dream of one day working as a Marine Biologist? Get ready for the summer adventure of a lifetime! The Chincoteague Bay Field Station of the Marine Science Consortium is excited to offer a Coastal Education and Leadership Program for rising High School Seniors. 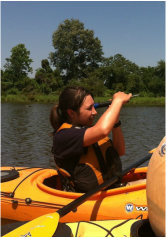 This internship allows students to gain experience in an Environmental Education program while researching a Marine Science Project that interests them. We are looking for eight rising high school seniors (students who are currently juniors age 16 and older) with an interest in education, biology or science. Students must have a strong academic profile and be interested in an opportunity to work in an outdoor environmental education setting. Interns will spend a lot of time outdoors in marine environments. Students who are enthusiastic and outgoing, can work easily with others and are organized, with good attention to detail will be the best fit for this internship. For 2 months students will live, work and play on the Marine Science Consortium’s main campus, the Chincoteague Bay Field Station. The Chincoteague Bay Field Station is located in Wallops Island, VA, just minutes from the island of Chincoteague and Assateague. This internship includes three components: programs, research and enrichment. Students will work alongside program staff to provide environmental education programs and summer camp activities; periodically attend college level courses; develop their own research project or legacy project; and explore the exciting marine habitats of the Eastern Shore of VA. This 2 month program is a wonderful opportunity to enhance and develop self-confidence, self-awareness, communication skills, and personal leadership style. The internship is a unique opportunity for students to gain job experience, to learn about the exciting field of Marine Science Education and to make new friends. Students will gain work and research experience that they may then apply in their senior year in high school and beyond. Since 1965 The Marine Science Consortium has educated and inspired thousands of children, youth, and adults about the marine and coastal ecosystems along the Mid-Atlantic Region through place-based, hands-on experiences. The Chincoteague Bay Field Station of the Marine Science Consortium is ideally located on Virginia's Eastern Shore, between the powerful Atlantic Ocean and ecologically important Chesapeake Bay. The barrier islands of the Eastern Shore create a series of habitats that are biologically diverse and geologically dynamic. These natural classrooms introduce students to a variety of concepts in the biological, chemical, and physical sciences. This is an unpaid internship. However most meals and all lodging during the program are free of charge. Interns are responsible for their travel to and from the program at the beginning and end of the summer. Interns are responsible for personal spending money during the program (i.e. coin operated laundry, all meals off campus during field trips, movies, etc). Interns are responsible for taking part in the SEA S.T.A.R. Trash-a-ton Fundraiser. This fundraiser raises money to cover the internship program’s enrichment trips, and intern meals and lodging.